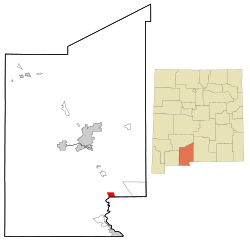 Anthony is a city in Doña Ana County, New Mexico, United States. The population was 9,360 at the 2010 census. It is located on the New Mexico–Texas state line in the Upper Mesilla Valley (immediately north of Anthony, Texas), and on Interstate 10, 27 miles south of Las Cruces and 21 miles north of El Paso, Texas. The city is part of the El Paso–Las Cruces combined statistical area. In an election held on January 5, 2010, Anthony residents voted in favor of incorporating the community. A total of 561 votes were cast, with 410 (73.1%) supporting the measure and 151 (26.9%) opposed. The new municipality officially came into existence on July 1, 2010. In its second elections held March 6, 2012 the City of Anthony voters elected two trustees, a new mayor and judge. The final results were as follows; for Mayor: Arnulfo Castañeda, 224 (winner); Juan Acevedo, 181, Two trustees: James Scott, 231 (winner); Pilar Madrid, 255 (winner); Janny Brumlow, 160, for Municipal judge: Peggy Scott, 340 (winner) The total number of ballots cast in the election was 1,391, according to a canvass certificate. Of those, 1,244 were cast on election day, 136 were cast in early voting and 11 were cast in absentee voting. Anthony is located at (32.006028, -106.600669). According to the United States Census Bureau, the CDP has a total area of 3.9 square miles (10 km2), all land. As of the census of 2010, there were 9,360 people, 2,467 households, and 1,858 families residing in the city. The population density was 2,362.4 people per square mile. The racial makeup of the city was 61.5% White, 0.8% African American, 0.5% Native American, 0.1% Asian, 0.1% Pacific Islander, 2.5% from other races. Hispanic or Latino of any race were 97.4% of the population. There were 2,467 households out of which 9.9% had children under the age of 5 living with them, 35.9% were under the age of 18, and 8.7% were over the age of 65. The median income for a household is $22,216. The per capita income for the city was $9,239. About 40.2% of the population is below the poverty line. Anthony, New Mexico Facts for Kids. Kiddle Encyclopedia.